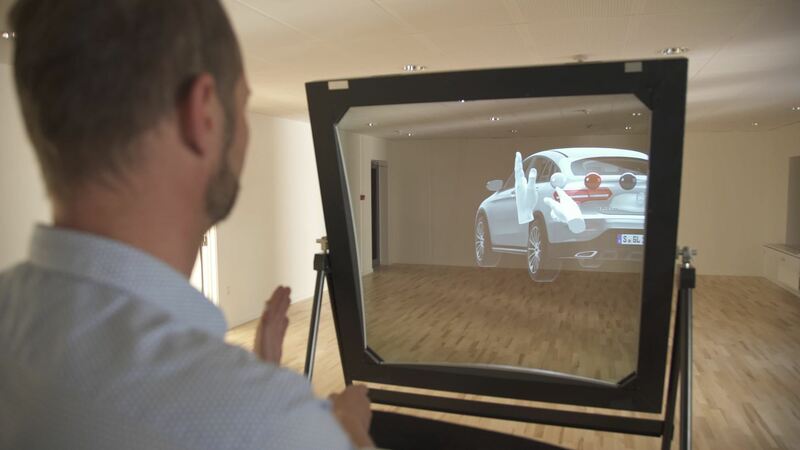 Mixed reality display manufacturer Realfiction has developed a 64-inch display capable of delivering 3D holograms without a headset. 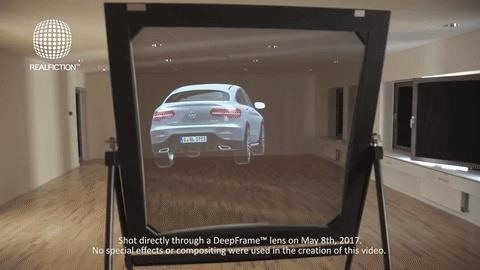 Billed as the largest display of its kind in the world, DeepFrame consists of a curved video screen that deflects interactive 3D images in 4K resolution onto a glass optic, which looks like a large window. Due to the magnification of the glass optic, DeepFrame is capable of projecting large-scale holograms that appear to cover several square miles. 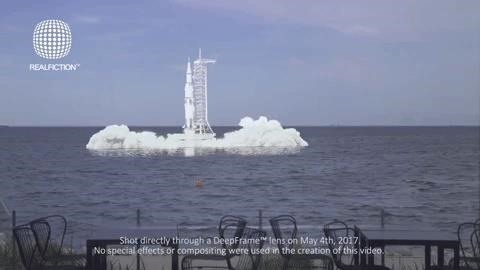 In a video demonstrating the technology, visitors to an aquarium in Copenhagen, Denmark observed a hologram of a rocket appearing to blast-off from the middle of the Øresund Strait. "Since 2008, we have been working on mixed-reality solutions that makes it possible for several viewers to share the same visual 3D experience embedded in the real physical world without the use of glasses. With DeepFrame, we have finally solved this challenge making it possible to erase the line between fiction and reality. Now you could potentially be seeing a lifelike 3D version of King Kong climbing the building across from your office window," said Peter Simonsen, co-founder and R&D director at Realfiction, in a news release. Like with its other mixed reality displays, Realfiction is targeting commercial enterprises, including retail, entertainment, and construction. Since 2008, the company has delivered smaller such displays to companies like Louis Vuitton, Tag Heuer, and Samsung. "This technology enables companies in nearly any industry to present new content and real-life experiences to their audiences, and in the very near future, we also expect it to become a popular technology in consumer products," said Clas Dyrholm, CEO of Realfiction, via the news release. Gavin Finn, PhD, president and CEO at Kaon Interactive, came away impressed with the demonstration video and the opportunities to integrate digital images in a physical space. "Where gesture interactions make sense, such as in museums, this can provide a 'holograph-like' experience for viewers in a way that could deliver engagement and understanding. The large screen size also has some potential value. I think that the combination of gesture interaction with the AR-like effect could very well have a unique effect," said Finn in an email to Next Reality News. Finn did have a few reservations. Kaon Interactive generates sales and marketing applications for companies like Dell and Cisco using Tango augmented reality devices. "The lack of portability of the experience (and even the device) is one potential concern, as is the question of specificity and complexity of the process of creating these kinds of one-off applications," said Finn. In an email to Next Reality, Dyrholm noted that a variety of formats and devices are compatible with DeepFrame, making interactive content development relatively easy. For instance, the interactive demo below was designed in Unity, with motion control courtesy of Leap Motion sensors. The company expects to offer DeepFrame commercially through its network of partners, with the first units shipping in August. At this stage, DeepFrame is a customized solution, requiring a planning and project management phases for each order. "The first units will primarily be to our resellers, and those customers whom we are already in contact with. The price of a DeepFrame depends on configuration and project. So there is no list price available, as each project is different at this initial phase," said Dyrholm. While a price is not available, a smaller display solution available from the company, the Dreamoc XL3, costs $7,999, likely placing the DeepFrame out of the range of the average consumer. However, Dyrholm revealed that a consumer model is in the works. "We are building the first prototype as we speak. But in consumer solutions price is a key factor, which in return comes with large volume production. And therefore project negotiations and commitments will determine when we see the first products on sale," said Dyrholm. Update: Comments from Finn were included after the original publication of this post. Are you excited about the prospects of glasses-free mixed reality on a large scale? Let us know in the comments below. Just found this cool new video of DeepFrame from their youtube channel featuring Asterix and Obelix. Really cool display!